Cross-pollination can occur if you plant multiple varieties close to each others. Your peppers may or may not be true to form (and heat). Plant them in a bright, sunny spot. The more sun, the better. Peppers love warmth and don’t do well with shade or cold, wet feet. Wait until the soil is actually warm before you plant. They can be planted in pots. Use at least a 5 gallon pot for maximum returns. You may need to stake or cage them for support. Use Espoma Bio-tone when you plant. This will help get your root system established much faster. The plants also end up being more drought and disease resistant. 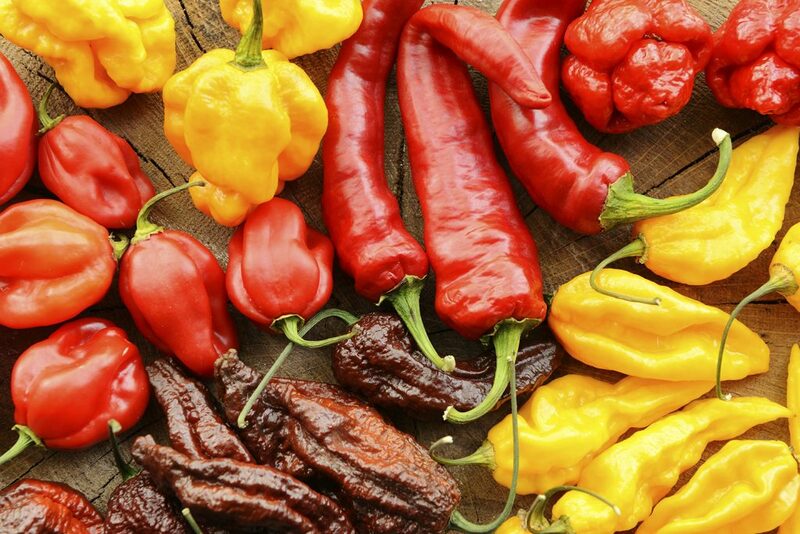 Watering—Peppers actually build more heat when you withhold water from them. It’s a fine line though, deciding when to water and when not to water. Don’t let the plants go so dry that they wilt. That just puts unneeded stress on the plant. Fertilizing—Every pepper grower has a favorite fertilizer. We like Espoma Garden-tone for ease of use (and it’s a great food!). You can always use some liquid kelp or fish emulsion if you like. Stay away from most of the commercial liquid fertilizers like Miracle Gro and you’ll have much tastier peppers. Harvest as often as you can. This will help the plants produce MORE peppers! Excess peppers can be frozen or dried, and used later. ‘Carolina Reaper’ is the hottest known pepper at this time. It consistently rings in at 2million + SHUs. There have been reports that a ‘Dragon’s Breath’ pepper exists, and rates higher at about 2.48 million, but these reports are unconfirmed at this time. Supposedly the folks at Puckerbutt Pepper Company have created a monster called ‘Pepper X’ that clocks in at 3.18 million SHUs. Neither ‘Dragon’s Breath’ nor ‘Pepper X’ are for human consumption.